A popular Welsh language children's periodical that became connected to the Welsh youth movement, Urdd Gobaith Cymru. The periodical's main contents were stories, poetry, music and articles on Welsh history. 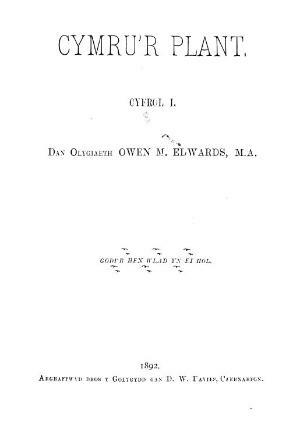 Amongst the periodical's editors were Sir Owen Morgan Edwards (1858-1920) and his son, the founder of the Urdd, Sir Ifan ab Owen Edwards (1895-1970). Associated titles: Cymru'r Plant Bach (1924); Cronicl yr Urdd (1929); Y Capten (1931); Y Cronicl (1937); Yr Aelwyd (1940); Cymraeg (1955); Cymru (1956); Cip (1987).